VT21 Low Profile Workstation | ICWUSA.com Inc.
VTLP Low Profile stows 4″ (10 cm) from the wall. VT21 with tilt and swivel monitor stows 5.5″ (14 cm) from the wall. VTTM Tandem Arm extends 28″, tandem arms swivel 180° and unit stows 7″ (17.8 cm) from wall. All VT21 models raise and lower 21″ (53.3 cm) with smooth, easy movement. They have locking lift assist which secures the units at any point in the range of motion. 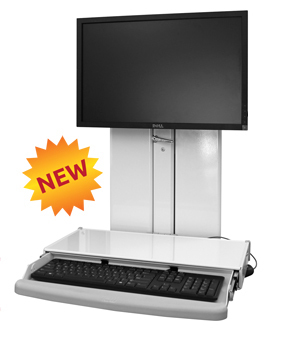 These mounts are comfortable, ergonomic workstations. WorkSurface Tray has a generous surface area for charting, mousing and scanning. Keyboard Tray is stowed inside the WorkSurface Tray, so it’s out of the way when not in use. Keyboard Tray adjusts to positive, negative and neutral tilt for your ergonomic comfort. A scanner mounting bracket that fits behind the monitor can be purchased separately.